- “Yellow Blue Tibia” by Adam Roberts (through the courtesy of Gollancz). See you again next Monday and until then I wish you an amazing week. I posted a lot about cover art lately, but I have to be honest with you, I can’t help myself. And with this new cover you will see why is so hard for me to do so. I like to wander in search of amazing artwork and of great book covers. 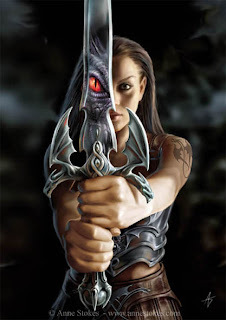 Yesterday, after I received the other two books in Brent Weeks’ “Night Angel” trilogy I was missing I went in a visit to his website and this way I found a new great book cover. 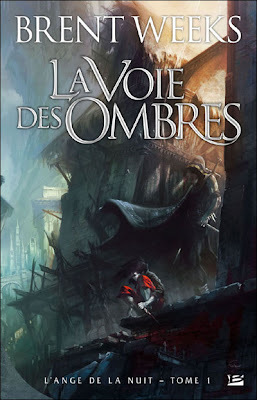 Brent Weeks shows on his site the artwork for the French edition of the first novel in the “Night Angel” trilogy, “The Way of Shadows”, which it is published by the Bragellone publishing house, made by an amazing artist, Frédéric Perrin. I could see also an interesting video presentation of Brent Weeks’ novel. So, I went to visit the websites of Bragellone and Frédéric Perrin and I ended up drooling all over the places (do not take this literally, please) because I found some beautiful things. 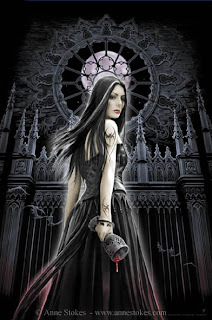 You can find also a page dedicated to the illustrators of Bragellone books where you can find other great book covers too. Ex Occidente Press is an independent publishing house from that doubtful place that was once called "la Porte de l'Orient" by travellers, seers and esoterists, generals and freemasons, poets and spies, prostitutes and rakes, salon artists and theologians, but which is known nowadays under the name of Bucharest. Ex Occidente Press specialises in rara et nova fiction of the supernatural, the odd and the weird, the strange and the decadent, the fantastic and the obscure, the very holy and the luxuriously heretical. Ex Occidente Press places equal emphasis on introducing both new works from contemporary writers and works from an earlier age of European literature that has been neglected in the English-speaking world. The title I saw was on excellent graphic conditions and if all Ex Occidente Press are like that one than the job done by this new publishing house is a very good one. I find their prices a bit expensive, but then again all the limited editions seem this way. I would certainly like to read some of their titles and to see how Ex Occidente Press develops in the future. And I have to discover an elixir of life too, because my reading list is gathering titles in a vertiginous way. "The Dog of the North"
But what is the source of Beauceron’s obsession with Croad? Can Arren reconcile his youthful ambitions with his growing feelings for Eilla? 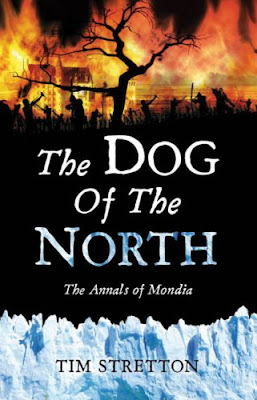 And just who is the Dog of the North?Tim Stretton’s debut novel is a spellbinding tale of loyalty and betrayal, homeland and exile, set in a brilliantly imagined world of political intrigue, sorcery, and warfare on an epic scale. Tim Stretton technically makes his debut with “The Dog of the North”, but it’s not his first written novel. “The Dog of the North” is his first novel which drew the attention of a publishing company, Pan MacMillan, but this novel was first self-published same as the first two written by Tim Stretton, “The Zael Inheritance” and “Dragonchaser”. “The Dog of the North” is set in a fantastical world and follows two storylines which are developing mostly in two of these world cities, Croad and Mettingloom. These two storylines are separated by time, but are linked to each other through the characters. One such link is the base of the general conflict and it will be revealed at the end of the novel, end which will connect in full the two storylines. Croad and Mettingloom are set in the world of Mondia, a world I find quite developed, especially when it comes to these two cities. However, Mettingloom is the city which attracted me more and I find the ideas, which are at its basis, more interesting. Mettingloom resembles a lot with Venice, Italy, with many aquavias and bridges crossing the city and has a strong naval power. But what I really liked at this city and this state is the fact that it is run by two kings, the Summer King and the Winter King. And as their names suggest their ruling is made through the seasons of a year, one of them is ruling throughout the summer period and the other throughout the winter one without the interference of the other. They have their own court, army and loyal servants and these courts can mingle with each other twice a year, at the Midsummer and Midwinter Ball. The storyline that develops in Mettingloom deals with the rivalry between these two courts, with the political intrigue and with all the self-interested characters resulting from this political intrigue. All of this revealed through one of the main characters, Beauceron, and his attempts to obtain permission and an army for an attack on Croad. Croad is a city that resembles a European Medieval city. Although Croad has allegiance to the king of Emmenrule it is run by Lord Thaume who imposes the local politics. The story centers here on four young characters, Oricien, Siedra, the lord’s children, Guigot, the lord’s nephew and Arren, a young boy who is taken under the wing of Lord Thaume. This is basically a coming of age, with the lessons the four take and the events surrounding their growing. There is also a background conflict in this storyline, between the two religion of this city, the Way of Harmony, the official religion of the kingdom, and that of the Wheel, which is seen as heretical. There are other small interesting things, sadly with scarce appearances through the story. Such an example is magic, named thaumaturgy because its effects are seen as miracles. But there is a small line between this magic and charlatanry and the thaumaturgies are seen as such people. One of the things that kept my interest and achieved through thaumaturgy is that in Menttingloom the heating of the noble houses is made by the summoning and the capture of small demons (called dimonettos). Unfortunately all these interesting aspects are lost in a small pace. I found the rhythm of both storyline a bit too slow. For the storyline of Beauceron the goal is obvious from the beginning of the story and although it was interesting for me to follow it through the tangles of local politics, it loses its tracks sometimes and left me restless in some places. The other storyline doesn’t have an obvious goal at the beginning and when the line it follows becomes apparent the rhythm seems slower than on the other storyline. “The Dog of the North” left me with mixed feelings, because it has aspects both good and bad, ups and downs and I believe that the reading of Tim Stretton’s novel requires patience due to its pretty slow pace and rhythm. Last month there was quite a debate regarding the differences between the cover artworks of the UK edition and US edition of the upcoming Joe Abercrombie’s novel, “Best Served Cold”. And that is not a singular case, there are many other covers that have such differences. I have to admit that, in most of the cases, I am very fond of the UK editions when it comes to cover art. But here is a case where I believe that the US cover is much better. I’ve recently read and enjoyed K.J. Parker’s novel, “The Company”, but I have to say that I am not impressed by the cover art (seen in the right). I think that is an interesting one, depicting a chain mail, and relates with the fact that the main characters are 5 retired veterans. And like the statement on the cover “The war is never over” it can deceive a reader, because the novel is much more than that and has a lot more captivating aspects. But with honesty I say I wouldn’t have picked this cover. The novel is scheduled to be released on the US market, by the same publisher Orbit Books, on September this year. And through their nice website and the publishing schedule from there I discovered the cover art of this edition (seen above). And that’s a very good and different one. In my opinion it captures much better the atmosphere and more aspects of the novel. And personally if I were in a library from the two of them I would certainly pick up the US edition. Late edit: I have to apologize because it seems that I overlook some aspects before writing my post. Thank you very much, Phoenix, for pointing that out. The initial cover is for both UK and US editions. The second cover is for the paperback edition which will be released on September. Anyway I believe that the second cover art is indeed an improvement. 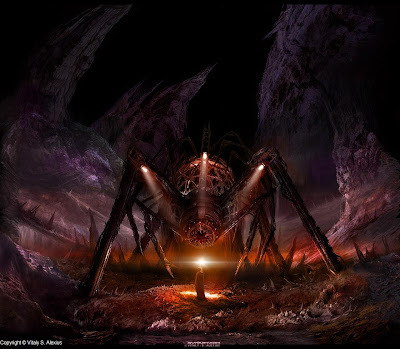 Vitaly Samarin Alexius was born in 1984 in the Siberian town Novokuznetsk. At the 11 years Vitaly started to study art in the city of Novosibirsk. In 1998 he moved to Toronto, Canada, where he is currently living. He continued his studies at the Ontario College of Art and Design, where he finished 2 years of “Environmental Design” and 2 years of “Illustration”. His talent is also manifested in photography and he is currently working at his first literature project which is also his thesis project, “Chronoscape” novel. Among Vitaly’s latest works we can find CD, books and comic covers, posters and concept art. Dark Wolf: Vitaly, thank you very much for this interview. How did you become interested in art? What was your first encounter with art? On the gabled cottage roof, covered in wooden planks, moldings, and swirly carvings, I’ve met a local artist. He was drawing some kind of forest on his canvas, via the view from the rooftop. I admired his glorious skill and pondered what it would be like to become an artist myself. Later on, I was enjoying a nice hike via the good old Trans-Siberian railway of the Soviet Union, while climbing various green mountains, covered with lush vegetations, with my good friends of that time. Upon the climb, we sat on the mountain side, enjoying the mid-day sun, bursting though the clouds, in an explosion of light rays that lived on their own accord, playing with the shadows of the mountains, forests, and fields below. The wind rolled about the fields, creating a magical, wavy sea of orange grasses. “Every artist has their style. Whatever shall be mine?…"
… and while staring at those rays of light I had decided- "I shall become the master of the landscape and the sky. And draw it in a manner of a tasty delicacy that can be consumed in large quantities via the spoon of visual perception- and thus the delectable sky full of light rays that you see in most of my works now, was born.”It took me (counts fingers)… 15 years to master those rays of light. Dark Wolf: I grew up with my mother’s art albums and from them I learned and I fell in love with the Russian painters such as Ivan Aivazovsky, Valentin Serov and Ivan Shishkin. Do you like any of the Russian classic painters and do you find inspiration in their works? Do you prefer other artists as well? Vitaly Alexius: Russian seascape painter Ivan Aivazovsky is core inspiration that defined my style. Aivazovsky painted the struggle of men against nature in a Romantic style. 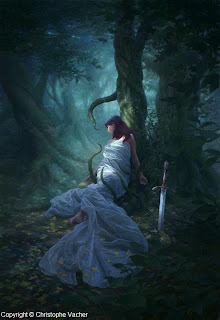 I pain the struggle of men against themselves in Romantically apocayptic style, a reinvention of Romanticism. I also enjoy works of Salvador Dali, Shishkin. As for modern digital artists – Craig Mullins and Sparth were a great inspiration, proving to me that an artist can be successful and well recognized just for Photoshop art. Dark Wolf: You moved to Canada in 1998 and continued your art studies there. Did your perspective on art change after your move? How different is the Russian art school than the Canadian one? Vitaly Alexius: Living in Siberian Soviet Russia has given me a great art education and provided me with an experience of two lifetimes, since I now live in Canada, which is a very different life compared to Russia. In terms of just education in Siberia; I had high arts school Monday to Friday, where I painted sketched crafted for 4 hours daily, right after regular school for nearly two years and it was completely free. Compared to Canada, Toronto - such education doesn’t exist here and all the art schools are incredibly expensive. There are some good private art schools in Canada which I’ve attended, prices of which are from 15-30 dollars an hour. Currently I’m in the Illustration program at OCAD University and life drawing courses are about 500 dollars for semester- 13 classes, each one with about 3 hours of drawing. DW: I’ve read that you try to develop a personal style, one which you named “Dreaminism”. Can you describe this style, please? What do you try to express and reach with “Dreaminism”? VA: Dreaminism is a feeling experienced in the split second before the waking, a thin line in which the mind still doesn’t realize which is more real – the dream or the world you wake into, when you can still clearly remember the dream, yet it is about to fade away. In my paintings I create realistic scenes of existing cities- New York, Moscow, Toronto, San Francisco- with a catalyst twist in them. DW: You name some of your works as “romantically apocalyptic”. 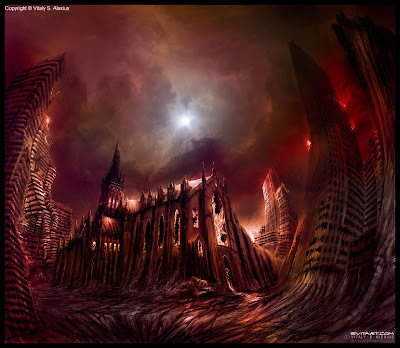 Do you prefer drawing apocalyptic visions? What sources of inspiration do you have for such works? VA: “We find that the average-there are a number of different size atomic bombs. The total devastation varies, but they average on this earth map here... If they are expertly spread out, you’ll find we really get a complete coverage of all humanity”. Excerpt from Buckminister Fuller’s lecture, “The World Game”. From the darkest dreams of imagination in my starkly-realistic and highly-detailed style “Dreaminism” I bring to my viewers, visions of the future that will inevitably come to pass if mankind’s planet-wide industrial machine isn’t adjusted in time. I have stood witness to a fall of a Nation and great noble ideals. I have seen Russian cities ravaged by human carelessness, industrialization, depression, oppression, crime and war. I have seen science fail and unleash death in the dark cases of Chernobyl and the Aral Sea “accidents”. My vision is that of a Romantic artist, with one exception - to showcase not just the destructive power of nature, but also the destructive power of man. 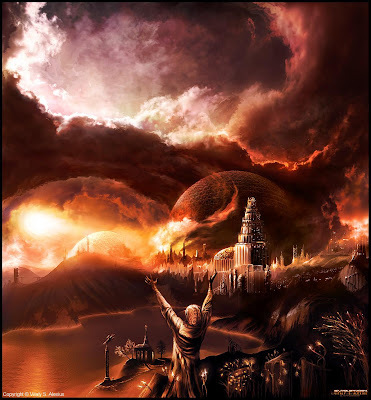 DW: Speaking of apocalyptic visions, are you interested in the religious aspect of the subject or in the science-fiction one? Or do you try to approach the subject from the perspective of both aspects? VA: Religious themes are often intertwined within my work- religion is an ultimate human tool just like nuclear energy- one can use religion to bring light, kindness and good to the world and another can use it to wipe away cities in holy wars, bring death, oppression and despair. DW: I’ve seen that some of your works on the subject were made in a traditional way. 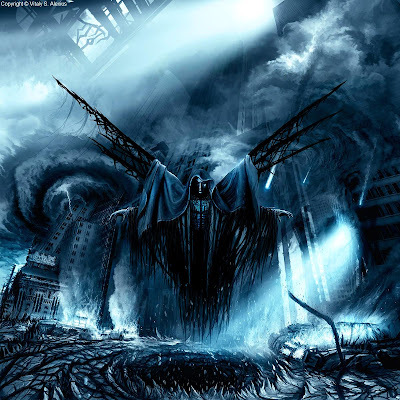 Which technique (traditional or digital) do you think that gives more power to the apocalyptic visions? Do you prefer one of these techniques for other subjects? VA: Digital medium allows me to work much faster and as I tend to work on massive scales- 1x1 meter canvasses, much cleaner for my studio. DW: You are interested in photography as well. Do you try to achieve the same things in photography as those from your art? What different perspective is the photography offering? VA: There’s a narrative to any photography and mine is no different, of course. My photography merely reflects and represents my journeys through the world. I always carry my camera with me, in hopes of some day capturing an extraordinary event like a UFO landing or the sky falling. Till that happens however, I’ll just stick to drawing such events. My photography also often captures images of modern cities and abandoned places, consumed by nature- searching for beauty in strangest places of decay. DW: Being passionate about both art and photography, do you use the art techniques on your photos? 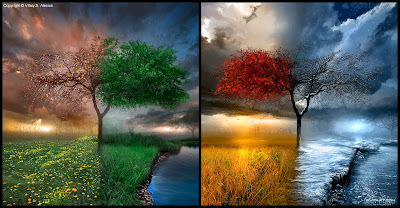 Do you use the photo manipulation process often? VA: Very often- that’s what Dreaminism is all about: enhancing reality with dream-like qualities. DW: You accompany many of your works with a poem you wrote. But may I ask which one is the source of inspiration? Does your art inspire your poems more often than the other way around? VA: Usually I write the poetry while or after I create a painting, although in rare cases painting comes after the poem. DW: Speaking of poems I reminded that you realized many CD covers. What involves the work on a CD cover? Does the music or the lyrics inspire the final piece for the cover? VA: The process varies- sometimes I do listen to the music of the musicians while I paint their cover, sometimes I go just by my heart. DW: You also made book covers. How different is the work on a book cover than on a CD one? Is there a novel for which you would like to illustrate the cover? VA: Usually writers give a bit more info on what to draw, more specifics, while musicians just say- “have fun with it, just include an angel in a dead city”. I very much would like to illustrate sci-fi novels by Brothers Strugatsky- The Inhabited Island, Hard to be a God or Roadside Picnic. 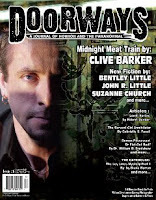 DW: You are writing your own novel as well, “Chronoscape”. Can you tell us something about it, please? Also may I ask when it will be released and if you have a publisher already? VA: It’ll be self-published in summer of 2009 and sold through the internet. 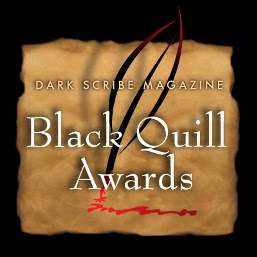 After that and final refinements and edits I’ll be looking for a major publisher. It’s a sci-fi novel that will have about 12 poster-illustrations in it done by me. It’s a story told in first person perspective about time travel- except not conventional forward-back time travel, but travel into faster and slower speeds of time- accelerating beyond the speed of light, decelerating so that centuries pass in a second. DW: After publishing your novel would you like in the future to gather your poems and artworks in a book? VA: Yes. A book of “collected works” will most likely be also published along with the sci-fi novel this summer. DW: What are your future plans? On what will you be working next? VA: I plan to open up a photo studio and get myself more involved in photography of the human body and in the meanwhile do more freelance work and travel around the world. 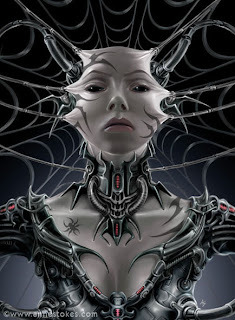 For more information about Vitaly S. Alexius and for a complete porfolio of his digital and traditional art and also photography please visit his website, Svitart. Heart of Veridon is the first book in the Burn Cycle. Jacob Burn is a disgraced airship pilot, and a man augmented by strange implants designed to keep him alive in combat conditions. An exiled son of nobility, he now makes his own way in the criminal underworld of Veridon, the City of Cog. But soon Jacob finds himself caught in a conspiracy of sabotage and murder between the government and the church, a mystery that stretches back into the roots of the city of Veridon itself. Lately I grew quite fond of the steampunk sub-genre and I am more and more interested in such titles. 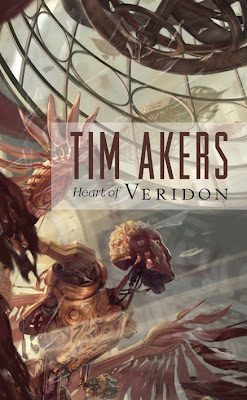 “Heart of Veridon” is one of these titles and caught my attention, besides the teaser and the genre it fits, with the cover art too. The artwork is made by the talented Jon Foster and renders a beautiful and catchy atmosphere. Although the information is a bit old already (it was posted on the Solaris blog, When Gravity Fails, on January), I discovered it, to my shame, only last week. - "The Birthing House" by Christopher Ransom (through the courtesy of Christopher Ransom and Sphere). The Academy of Science Fiction, Fantasy & Horror films has announced the nominations for the 35th Annual Saturn Awards. The Academy of Science Fiction, Fantasy & Horror was founded in 1972 to honor and recognize genre filmmaking. Over the years, the Academy has expanded their reach to include other film genres. The organization also honors television, and home entertainment. Robert Holguin presently serves as President of the 37 year old organization. The organization has honored many leading visionaries in its’ history including: Gene Roddenberry, Rod Serling, Fritz Lang, Robert Wise, J.J. Abrams, Zach Snyder, Christopher Nolan, Bryan Singer, Ray Bradbury, Ray Harryhausen, James Cameron, George Lucas, and Steven Spielberg. The show will take place on June 25 at a site to be announced. On the top of the nominees are The Dark Knight with 11 nominations in movie categories and Lost also with 11 nominations in television categories. Robert V.S. Redick made his debut last year with the first novel in “The Chathrand Voyage”, “The Red Wolf Conspiracy”. The Gollancz edition published in February 2008 had a wonderful cover made by the very talented Edward Miller (Les Edwards). 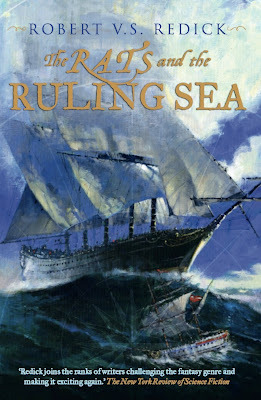 This year on August the second novel of the trilogy will be published, “The Rats and the Ruling Sea”, and like the first one it benefits from the artwork of Edward Miller. I really like that both covers follow the same line and general aspect and that gives Robert V.S. Redick’s series an interesting and catchy identity when it comes to cover art. THE RATS AND THE RULING SEA begins where THE RED WOLF CONSPIRACY ended; Thasha's wedding is hours away. It is a wedding that will both fulfil the promise of a mad god's return and see her murdered. Pazel has thwarted the sorcerer who would bring back the god but both sides now face deadlock. Can Thasha be saved? Can the war between two Empires be stopped? THE RATS AND THE RULING SEA is, once again, focused on the giant ancient ship, the CHATHRAND, but now she must brave the terrors of the uncharted seas; the massive storms and the ship swallowing whirlpools and explore lands forgotten by the Northern world, all the time involved in a vicious running battle with a ship half her size but nearly her match. Robert Redick's new novel takes the reader further into the labyrinthine plots and betrayals that have underscored the trilogy from the beginning. 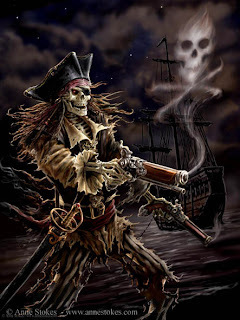 We learn more about the Ixchel as they fight for survival against the Chathrand's rats, discover more about the true motives of conspirators, live with Thasha and Pazel as they face death and deceit, and as the Chathrand sails into the infamous Ruling Sea. Robert Redick's sequel to the acclaimed THE RED WOLF CONSPIRACY is a masterpiece of plotting and adventure. As each page turns the reader shares with the characters the dawning realisation that nothing is at it seems. Mike Carey built himself a name in the comic books industry, being well known for his series “Hellblazer” and “Lucifer”, and “The Devil You Know” is his first step into the world of literature. Although the Felix Castor series, from which “The Devil You Know” is a part, will reach its 5th volume this year and despite his career in comics this novel is my first step into the works of Mike Carey. My childhood dreams were haunted by great adventures and mysteries, constantly fueled by authors like Sir Arthur Conan Doyle, Agatha Christie, Georges Simenon or Dashiell Hammett and heroes like Sherlock Holmes, Hercule Poirot, Inspector Maigret or Sam Spade. Felix Castor, the hero of “The Devil You Know”, might not fall in the same category as these heroes (he is a freelance exorcist), but he reminded me with great pleasure of this heroes and he can successfully follow them in a timeline of investigators. But Felix Castor is unique and has characteristics that instantly made me like him. Besides his ability to see ghosts and his capability to exorcise them Felix proves to be an average human and sometimes displays a lack of luck that will not make anyone envious. I liked that Felix has his own issues to deal with, I liked how he questions his job and he doubts his abilities. What made me like him even more are his sense of auto-irony of humor, proved not only once throughout the dialogues of the novel. Felix Castor is a complex character and Mike Carey managed to create a personage who looks and sounds real, with his weaknesses and strengths. Felix Castor investigates a case which involves paranormal aspects. Actually the whole world has paranormal aspects and is populated by paranormal presences, ghosts, zombies, demons or were-things. But Mike Carey doesn’t exaggerate on this aspects, he manages to build a wonderful binding between the real and paranormal life. The setting of this investigation is London and although the author doesn’t make detailed descriptions of the places present in the novel I could get a feeling of the great English city. And besides the setting and the main character the plot played an important role in the pleasure of my reading. With a perfectly balanced mix of action and rhythm the plot will seem to turn the pages on its own and the mystery will be drawn to the last chapters, but seasoned along the way with tension, humor, drama and twists and turns. I enjoyed the plot and the mystery a lot and I have to admit that although I had in mind something from the outcome it was only a small part of what I expected. The secondary characters might not be as powerful as the main one and there are a few moments that seemed pointless in the general setting, but Mike Carey's “The Devil You Know” is what I am looking for in my readings. 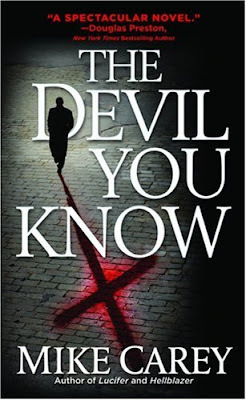 And like the novels written by the authors I mentioned at the beginning of my review “The Devil You Know” is a novel which with certainty I will re-read at least once more in the future. But until then I will enjoy meeting again Felix Castor in the next novels of his adventures. Christophe Vacher is a French artist who started as a background artist and created concept artwork for movie, television and animation industry from 1989. 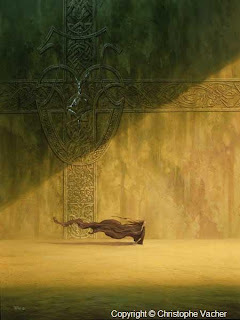 Since 1993 Christophe Vacher he joined the Walt Disney Company and started to work at the company Paris-based animation unit, where he painted backgrounds for animated films as “The Hunchback of Notre-Dame”, “Runaway Brain” and as head of the background for “A Goofy Movie”. He continued his collaboration with Disney after his relocation to California in 1996 and here he provided painting backgrounds and concept artwork for “Dinosaur”, “Hercules”, “Tarzan”, “Fantasia 2000” and “Treasure Planet”. His career includes also the concept artwork and paintings done for the Dreamworks’ “Shark Tale”. After leaving the Disney studios in 2002 he worked on his personal artwork for galleries and freelancing art for studios, books, CDs and video games covers. One of Christophe Vacher’s present projects is the Art directing of the CG feature film “9”, produced by Tim Burton and directed by Shane Acker. Dark Wolf: Christophe, thank you very much for your amiability and the opportunity of this interview. France has a vast cultural background and is a country that breaths art, but may I ask how did you become interested in art? 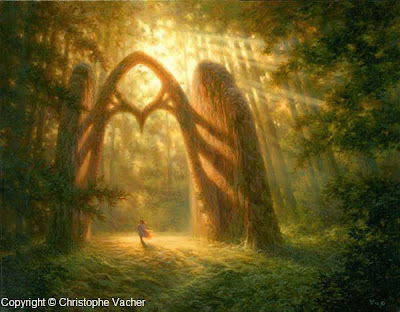 Christophe Vacher: I always wanted to be an artist. When I was 4, I started to draw even before learning how to write. At first, I wanted to be a comic book artist, and was driven by it. I was about to start an book series with one of the veterans of French comic books (Phillipe Caza, who created the magazine “Heavy Metal” with people like Moebius and Druillet in the 70s) when I started animation. Eventually, I moved to the US in 1996, where, in parallel to working at Disney Feature Animation, I started to develop my own paintings for Art Galleries on the side. Dark Wolf: Do you consider that you are influenced more by the classical art or by the modern art? Which artists inspired and influenced your art so far? 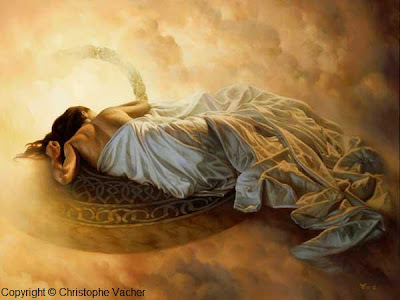 Christophe Vacher: Definitely more by Classical Art. Many artists influenced me. My actual style is influenced by old schools like the Great American Illustrators, the Hudson River school, The Romantics and the European Symbolists for their grandiose, theatrical scenery; my style has also been shaped by contemporary artists like Sandorfi, Beksinski, Ugarte and The Visionaries (Les Visionnaires) in France. All of these I credit for their striking visions. I respect Modern Art and the extra touch it can bring to the evolution of Classical Art, but Modern Art (and I’m talking here more about abstract Art) has done a lot of harm to Art schools at large, all around the world, by ridiculing the classical foundations of Art, pretexting evolution, and taking support from examples such as Picasso, Miro, Chagall, and all the artists from the early 20th century to destroy Classical basics. The result today is appalling. Students coming out of those schools have no qualifications other than “yeah, I can do whatever I want”. Some of them make it into Art Galleries, but how many? And the worst part is that Modern Art feeds from the financial speculation artificially created by the pseudo-intellectuals and the Art scammers who know the system very well, but intentionally ignore real Art based on Classical training. Why is that? Simply because classical Art usually takes more training and more time to create, as opposed to most Modern Art that pretends that spending a couple of hours mixing Oxidation Painting copper metallic pigment and urine on canvas is Art (i.e. Andy Warhol). Therefore, Modern Art makes money much faster. The trick here only relies on the skills of business scammers who artificially build fame and reputation around an artist’s work to raise his value. It has nothing to do with Art. It is sometimes disturbing to me to see how people are easily convinced that such or such piece of Art is good just because they are told so by the gallery owner who, precisely, is trying to sell it to them! Where have common sense and personal opinion gone? Curiously, the renewal of Classical foundations is happening through Internet. Many people from the new young generation started to want to learn the Classical basics, and started exchanging information. Many people asked me technical questions over the years. Now, there are many amazing new young artists on the net who mix Classical work with the digital media. It’s pretty astonishing. The only thing is that they were raised only on computers. So, there is hardly anyone practicing with real paint nowadays. But who knows, maybe it will come back. Dark Wolf: You say that your work is mostly influenced by music, travel and personal experience. How does music influence and inspire your art? On your travels are there images or scenes that you feel that need to be painted right when you see them? 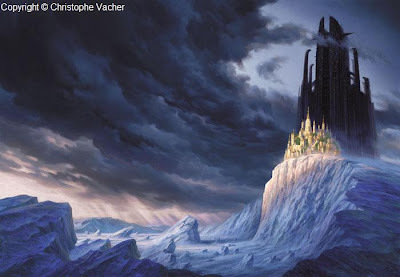 Christophe Vacher: It’s hard to describe. 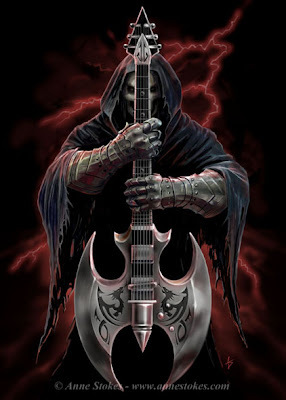 You hear the music, and it triggers images and feelings inside you. Or you see shapes around you, and suddenly, your brain translates these shapes into other potential images, based on what you’ve seen before, what you feel, what you like, etc… It’s rare that I find a perfect scene ready to paint, especially because my images involve imaginary worlds. So, there is always a pictural translation to make first between reality and fiction. DW: You’ve started to work for Disney at the Paris based animation unit. I am certain that many people are curious about the work behind the wonderful Disney’s cartoons. How is the work on a company like Disney? What involves the work on a specific animated film? CV: It would be too long to describe in details the work for an animated film, especially because there are many differences between traditional animation and CG animation, but also because I had many different positions over the years. I worked for them for 9 years, and overall, I think it was a great experience. The corporate world is what it is. It's the same everywhere, whether you go to Disney or any other company. So, you just have to deal with it. But if you can be OK with that aspect of things, and look at the brighter aspect, you'll see that there are a lot of positive and irreplaceable experiences you will get from it. "The Hunchback of Notre-Dame" will probably remain a great memory for me, as we were working so close to the real "Notre-Dame" and were able to see and touch it everyday, putting on film one more time in History this fantastic piece of architecture. An Artist's dream. DW: Working still for Disney you moved to California in 1996. Did your style change after your move in the United States and did it bring new elements in your art? Is the art perception different in the United States than in Europe? CV: My style kept evolving, not specifically because of my move to the US, but rather, because of the new things I learned in Art techniques and the other artists I met along my journey. The Art perception you find here is not radically different than the one in Europe. The major difference, though, is that here in the US, Art is more respected if it makes money, or if the artist is dead, or both. In France, there is a TV guy who hosts a book and literature show. One day, he said that “in Europe, people take money to make Art. In the US, people take Art to make money”. It’s a pretty radical and general statement, but I think I agree with it quite a lot. DW: In the majority of your works you use traditional methods of work (oil, acrylics, pencil). Do you prefer to work in the traditional way? How do you feel about the digital tools of painting? CV: I discovered Digital for the first time working on Art concepts for the movie "Dinosaur". 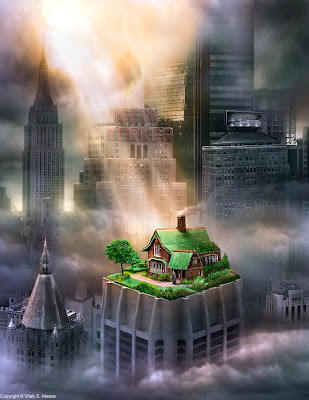 I did paintings and photo manipulations on Photoshop and Painter. Then, I dropped it for a few months and went back to traditional. But I started to miss working with Digital. So I went back to it. And I learned how to really appreciate. Since then, I bought my own material, and constantly juggle now between Digital and Traditional. For instance, I do my paintings for galleries with oil or acrylic paint, and most book or videogame covers on Photoshop. It's faster, more effective, and the control of all parameters (values and tones, color saturation, etc…) allows easy changes. And publishers don't need originals, only the image. To paint for a gallery is different. People who buy a painting don't do it only for the image, but also for the tactile and sensual experience, something that Digital will never be able to give -at least not the same way. In terms of 3D, I did a little bit of traditional sculpture, and I’ve learned Maya 3D intensely for a year and a half. I needed to do it to convert from my traditional animation skills to a more appropriate type of media for today’s animation. Very interesting. I'm also interested in Digital Matte Painting. DW: I’ve noticed that many of your pieces have floating stones, in the foreground or in the background. 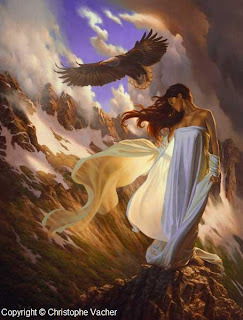 Is this a personal touch of Christophe Vacher on his works? What is the symbol of this floating stones? CV: Well, if you want the short answer, I’d say when they are not floating cities, they represent some kind of guiding Spirits, like in “The Messengers”. DW: It seems that the fantasy themes have a central position in your works. Is this your favorite theme? Are you interested in fantasy themes outside the art domain as well? CV: I like Fantasy because of the more organic, impalpable and spiritual side of it, as opposed to science-fiction (although I love sci-fi too, and it can have fantasy elements in it). 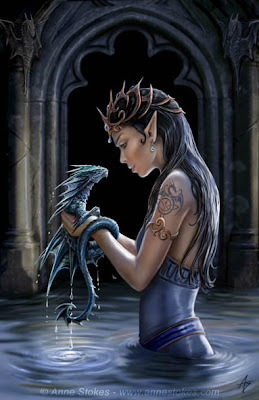 However, rather than typical Fantasy (elves, dragons, princesses and kings,…), I much prefer a type of Fantasy that takes you off the beaten paths. A movie like “What dreams may come” could have been really great, because of the exploration of the Life after Death theme and the amazing visuals. Very different type of Fantasy. Unfortunately, the story got convoluted, boringly unclear, and the characters eventually got quite annoying. DW: Your works give the viewer beside the sense of beauty a sensation of wonder and awe. Does the landscape image play a single role in your work or is a spiritual influence on your pieces as well? CV: Landscapes can express something really majestic and beyond words when you take time to let yourself absorb the experience. Everything is a matter of how you perceive what is around you. I guess this is a similar feeling I connect with inside when I imagine landscapes, and it is even multiplied when music triggers the vision. So, in that sense, yes, you could say that landscapes influence my pieces in a spiritual way, but these images are more like the direct result of something that happened inside first, a feeling translated into an image. DW: The main figures of your works are women. Do you consider that women, besides their beauty and grace, are more expressive than the male figures? CV: Not necessarily. Male figures just express different things, like strength, athletic display, etc…which can also be very interesting to paint. But I really enjoy painting the lines, feminity and grace expressed in a woman’s figure (it can also be in the elegant folds and curves of the model’s clothes or drapery) and the light and texture associated with them. DW: I know that you are the art director of the CG animated movie "9" and from the trailer I’ve seen the movie looks amazing. How is the work on this project and can you tell me something about "9"? CV: “9” is getting a very good buzz on internet, since the trailer came out. We worked hard on it and are very happy with the result. The director Shane Acker and the producers want to really take the time to promote it, keeping the mystery as long as possible, and they have eight months to do it. So, I can’t tell you anything before the official release, but I can tell you this: it was one of the best experiences I’ve had in animation, both because of the job I had on it, and also because of the totally unusual type of subject matter. DW: What are the other projects and plans that you have for the future? CV: I’ve been working on and off on different early movie projects, but I can’t say anything about them yet, especially because none of them have been completely green lit for full production yet. Some are already getting into financial trouble due to the world financial crisis. But I’d like to take a break, travel again for a while and work on my more personal projects: painting for art galleries, writing and illustrating stories, maybe a compilation of my images in a book. Many people asked for it, so, I’ll have to put myself to it soon. 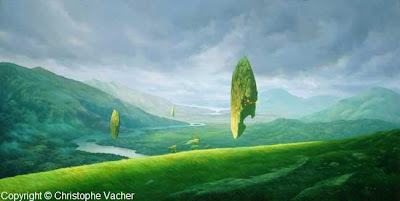 For complete information about Christophe Vacher and a more comprehensive portfolio please visit his website, Vacher.com.